Amazon's smart clock, the Echo Spot, is coming to the UK this month | What Hi-Fi? A smaller, rounder version of Amazon's Echo Show, the £120 Spot can play Amazon Video and stream music through Spotify and Amazon Music. 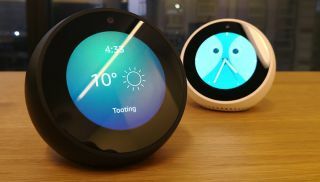 As the Echo Dot is to the Amazon Echo, so the Echo Spot is to the Echo Show, and Amazon's latest Echo device, which has been in the US for a while, is finally arriving in the UK this month. And, much like the Dot, the Spot has a range of similar features: it can play music through Amazon Music and Spotify, but here the lyrics will appear on screen (if using Amazon Music). Ask it to read you the news and it will, accompanied by a video or animation depending on the news source. The touchscreen's user interface works in all the ways you would expect: slide down from the top to reach settings, swipe across to change menus. There will be 17 clock faces available at launch, with Amazon pitching this to be a customer's first Echo device. Although Amazon and Google are still butting heads, so there isn't YouTube functionality on the device as there was on the Show, you will be able to play content from Amazon Prime Video. Whether you'll really want to be watching episodes of Preacher on a 2.5in LCD screen that's round is another story. On the top is a little VGA camera, letting you call other owners of Echo devices (or your own Echo device in another room). If the person you're calling has a Spot or a Show, you'll be able to have a full video chat, similar to using Apple's FaceTime feature or Microsoft's Skype. If not, then it will revert to a voice call. If you have smarthome products, you can also use the Spot to control them; although it doesn't have the full capacities of the Amazon Echo Plus, which includes a built-in smarthome hub. The Spot has a 2W speaker so you can hear Alexa or play your music natively, although you can connect it up to larger speaker systems using Bluetooth or the 3.5mm output. This is what we would recommend as the speakers are around the bottom of the device, so sound quality likely won't be able to compete with similarly priced wireless speakers. The Spot is priced at £120, and is available for pre-order now. Shipping will start on the 24th January.